As my last post suggested and as the findings from my previous performance concluded, the dramaturgy for sited performance most productively involves the collection of material from three main sources: its archive and repertoire and the creator’s phenomenological response to the space of performance. 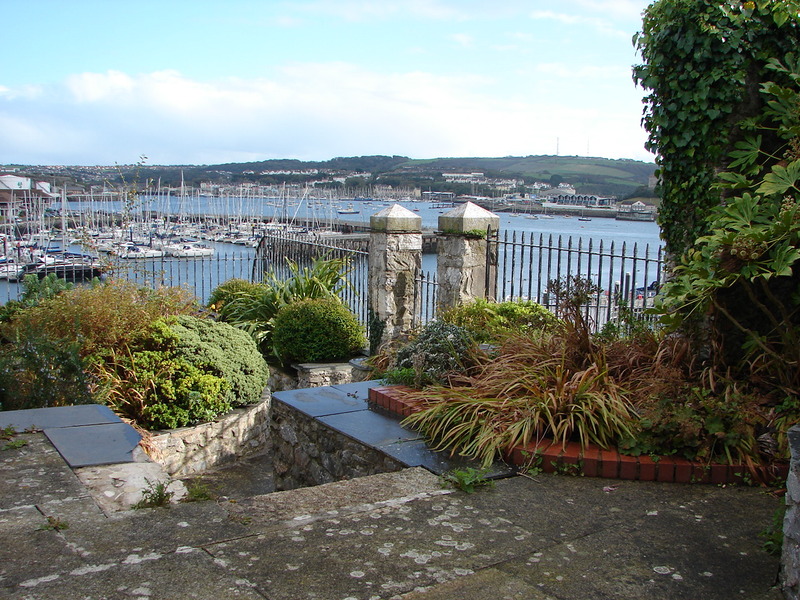 At the end of 2011 I created along with Derek Frood and sound designer Belinda Dixon, an audio walk that took you through streets of the old Barbican area in Plymouth. A twenty minute journey starting and ending at the Barbican Theatre in Castle Street, the audio can be downloaded onto an mp3 player and listened to as it guides you on a solo walk. The performance was inspired by an archival 1851 Government paper into the living conditions in Plymouth. Entitled Damnation Alley that was the nickname for Castle Street, which was infamous in the nineteenth century for its amount of ale houses and brothels. 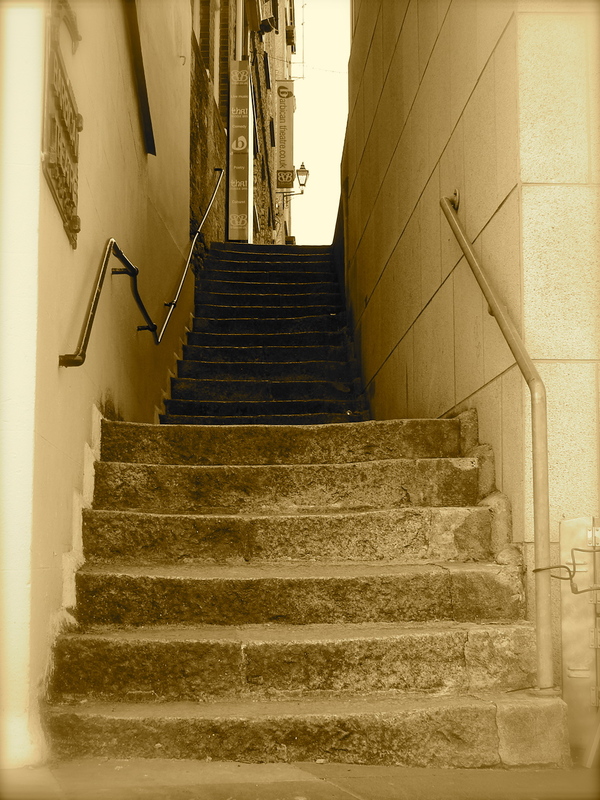 Sailors arriving on shore would make Castle Street their first port of call and over a hundred and fifty years ago these steps above would have been covered over, giving entry into the alley a sense of the unknown. Using the Government report alongside two real life characters, the Reverend Francis Barnes, vicar of Holy Trinity church 1851-1904, and Mrs Cload, lifelong president of the Sutton Harbour Regatta and campaigner for the rights of Barbican tenants, we layered the archival stories we found and the oral history Belinda had worked on previously, with periods of sensory participation. The walk leads you into a hidden garden, where you are invited to pause the audio and listen to the twentieth century sounds of the streets and water below. The sound design on Damnation Alley not only gives the domestic everyday noises from the nineteenth century street but also ambient sound to help this phenomenological midway point in the garden. Participating is the best way to engage with the audio but as a second choice Derek has made a film for those who couldn’t make the walk. Listening to the Rev Barnes as he roams Castle Street at night, breaking in on people in the beer houses and shaming them with his denunciations gives you a small flavour of the extent of the debauchery in 1851 Plymouth. You can watch the film here. This entry was posted in Performances and tagged Barbican Theatre, Belinda Dixon Media, Castle Street, Damnation Alley, The Barbican Plymouth on October 5, 2013 by Ruth.